It would be easy to simply say Dr. Patti Keely was a world-class, nationally recognized breast cancer researcher at the University of Wisconsin School of Medicine and Public Health. And, that would be correct – but only part of the picture. Keely succumbed to advanced pancreatic cancer June 24. Those who knew her help reveal all that Keely was. Her leadership, mentorship and her collaborative nature allowed her to make a tremendous impact in this world, according to Dr. Howard Bailey, associate dean for oncology and director of the University of Wisconsin Carbone Cancer Center. In addition to wife and mother, Keely’s official titles were chair of the department of cell and regenerative biology at the School of Medicine and Public Health, Jan and Kathryn Ver Hagen professor of translational research, and principal investigator at the Keely Lab. To the eight current members of her lab, and the more than a dozen past members, she most surely made an indelible impact, according to various news stories chronicling her inspirational life journey, which included two previous battles with cancer. In a beautiful show of appreciation, the current members of the lab threw a dance party for her in April 2017 to celebrate her life and what she meant to them. “This is the Keely Lab, it’s all affected by who she is,” said Joseph Szulczewski, a graduate student who works at the lab, in an interview with a Channel 3 television reporter regarding Keely. Her prolific research career, which includes countless publications, was most recently focused on cell signaling related to cellular differentiation and transformation and included her sentinel research on the role of the cellular microenvironment in the behavior of breast cancer cells. 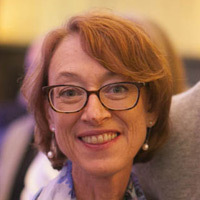 Her academic and research leadership roles also included appointments as the co-leader of the Tumor Microenvironment Group at the UW Carbone Cancer Center, co-principal investigator at the Laboratory for Optical and Computational Instrumentation, and an affiliate appointment in the Department of Biomedical Engineering. In addition to her research and academic record, Keely was also a wonderful colleague and friend, according to Dr. Robert Golden, dean of the School of Medicine and Public Health. “She leaves behind a remarkable legacy as an outstanding scientist, dedicated mentor, strong academic leader, and caring and committed person,” he said. A memorial service for Keely was held July 10 at The Pyle Center, 702 Langdon St., Madison. A fund has been set up in her name, and donations can be made at online to through the University of Wisconsin Foundation. Below, watch a video from 2013 in which Keely described the personal connection to her research.